Easily made from tofu at home, this faux cottage cheese will not make anyone believe that they are eating dairy but it is delicious in its own right. It's a great way to indulge in your craving for dairy without giving up your ethics. What Is Organic Vegan Cottage Cheese? Vegan cottage cheese is merely a mixture of mashed, organic tofu mixed with other things to give it flavor and the proper texture. There are as many variations of organic vegan cottage cheese as there are people. Try several recipes and experiment to get exactly what you want. There isn't a vegan cottage cheese available commercially, partly because it is so easy to make that there is little market for it. Are There Any Cheeses that Do Not Contain Rennet? Which recipe you like the best will depend on how you will be using the vegan cottage cheese. Some recipes result in a cottage cheese with a sweeter flavor so that they can be used with fruit. Others have a savory tang to them for use with herbs and vegetables for a quick snack. Your vegan cottage cheese will only be organic if everything you put into it is also organic. Be sure to look for the certified organic label on every ingredient you use. This is the perfect vegan cottage cheese to add to pineapple, pear, or other fruit. It makes two cups of cheese. 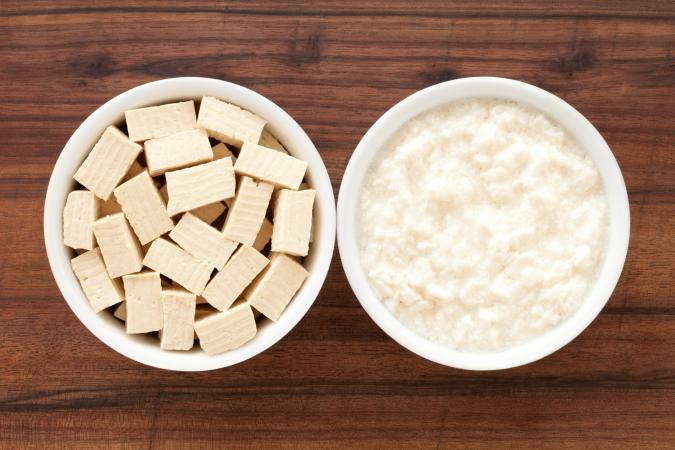 Mash the tofu with the remaining ingredients until it has the texture of cottage cheese. Place in the refrigerator and chill at least five hours for the flavors to develop. If you dislike the soy flavor, try simmering the tofu for one minute in a pot of water before combining with the rest of the ingredients. This will cook it just enough to remove the raw soy flavor. If you want a creamier product, try adding a few tablespoons of vanilla soy milk. If you will be using this as the filling in a cheesecake, be sure to add two tablespoons of cornstarch to help it hold together. With this recipe or the sweet one above, you can come up with your own vegan version of the Blue Plate Special, make blintzes, or just enjoy a healthy, high-protein snack. Mash the ingredients up with a fork until it reaches the right consistency. You may add more or less olive oil to achieve the correct consistency. Vary the ingredients to vary the flavors of this versatile vegan cheese. Why Not Dairy Cottage Cheese? Vegans do not use animal products, usually for both ethical and health reasons. Most commercially available cheeses, including cottage cheese, are made with some form of rennet. Rennet is taken from the inside of the stomach of a calf or other baby animal during the butchering process. It is used to coagulate the milk as the first step in cheese making. While there is a vegetable-based rennet available it is not commonly used commercially. Many commercial dairies, even organic ones, do use certified humane methods of raising the animals, but most vegans prefer to stay away from dairy altogether. You can substitute these cottage cheeses in any recipe, cooked or not, that calls for dairy cottage cheese with good results. With these recipies, you can indulge yourself in a healthy way.